Mondays have a way of bringing out the crazy in all of us. Still, you manage to maintain some semblance of sanity. Let the loon in you show in shoes that are bananas (B-A-N-A-N-A-S). Blogger extraordinaire, Kitty Bradshaw, (who's seen her fair share of manic Mondays) submitted this pair of Naughty Monkey "Parade" sandals (available at Sissy in NY or via Amazon.com for $79.00). 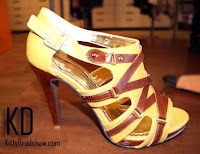 With their 4 inch polished cork-looking heel, side cut-outs and cheery yellow hue, they're definitely fun. However, the contrasting criss-cross straps add a little serious touch. Like you, though, they're super versatile and more neutral than they may seem. They'll go great with this season's military and safari inspired looks. Toast the day's end with a "Bonbon of the Vanities" cocktail. 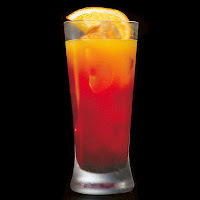 According to the Intoxicologist, it combines Russian Standard Vodka, banana liqueur, peach liqueur, orange juice and grenadine. It'll be a tropically sweet way to cap off your crazy day. However, keep in mind that it's better to douse your sorrows than drown them. Too many may result in things going from tough to terrible. *P.S. If you have a pair of shoes for which you'd like a drink pairing, send an image and description. I'll be happy to hook you up.